The Man Who Killed Hitler and Then the Bigfoot, a film that definitely wins the award for best title at Fantasia Fest, isn't really about Bigfoot. In fact, the Bigfoot subplot, which doesn't arrive until halfway through, feels like a perfunctory afterthought, shoehorned in for the chance to have fun with some iffy B-movie effects. Despite this bizarre sojourn, The Man Who Killed Hitler and Then the Bigfoot is very sweet without being saccharine, and features a fantastic-as-usual performance from Sam Elliott as a man confronting his age, his mortality and his past mistakes. Taking place primarily in the mid-'80s and flashing back to the '40s, Sam Elliott stars as the titular Man, Calvin Burr (with Aidan Turner, who wisely decides to not attempt to emulate Elliot's infamous voice, as a younger Calvin). After leaving his sweetheart Maxine (Caitlin FitzGerald) behind to enlist in the war, Calvin is recruited on a secret mission: assassinate Hitler. Calvin's tracking and espionage skills make him the ideal man for the job, and he successfully takes Hitler down. However, as Calvin explains later in a monologue (one of many great, scenery-chewing scenes for Elliott), killing Hitler didn't stop the atrocities of the Holocaust: the man may have died, but his evil ideologies lived on, and a massive cover-up took place. Haunted by this in his old age, as well as regret for leaving Maxine behind, Calvin lives a lonely, mundane life — until the CIA and the RCMP recruit him to kill Bigfoot. The Bigfoot plotline is the film's biggest flaw. It's a bizarre segue in a film that plays out like a straightforward drama, and one suspects that Krzykowski was asked to cut down on the B-movie elements. If that was the case, it's not hard to see why — the Bigfoot scenes comprise perhaps 15 minutes in a 98 minute film, are completely different tonally, and they're not great. 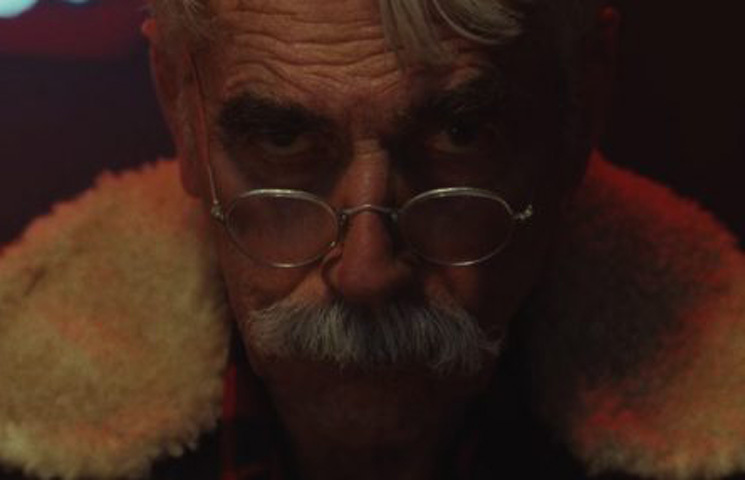 It's all good fun to watch Sam Elliott tear it up in the Canadian wilderness, but his bad-assery in the Bigfoot segments never come close to topping an earlier scene where he beats the crap out of three muggers. The Bigfoot itself also looks pretty stupid — it's a guy in a furry monster suit with plastic eyes and claws. It stands in stark contrast to a movie that otherwise looks great, with warmly-tinted, period-appropriate colours and staging. The flashbacks with Young Calvin and Maxine, as well as the present-day interaction between the older Calvin and his brother Ed (Larry Miller), are much better; genuinely effecting and bittersweet. Turner and FitzGerald and Elliot and Miller have great chemistry with each other, and while an overwrought score occasionally edges their scenes into cheesy territory, their performances feel authentic and earnest. Although the Hitler assassination plotline is only a little longer than the Bigfoot one, it's actually engaging: we track Calvin through a spy camp in Russia (as well as a tense straight razor scene that's one of the film's best), across mountains and lakes, all the way to Germany, where he dresses up as a Gestapo and covertly puts a bullet in Hitler's brain. It's a strange, uneven film with an even stranger title, but The Man Who Killed Hitler and Then the Bigfoot is buoyed by great casting and by its themes of regret and nostalgia. If only the man had just killed Hitler, and not the Bigfoot.